During my first real relationship, I had gotten pretty close with my lovers family. They included me in family events, helped me spend more time with my then girlfriend and her mother even took me to get my hair done. Ill just say I loved her like a second mother. Towards the end of our relationship I'd go and see her family even when she wasn't around because I did feel close to them, but I knew that this period couldn't last for too long. It's perfectly okay to keep in touch but lengthy visits and going out of my way to see them wasn't something I believed should continue. Today, I still make sure to always wish her mother a Happy Mother's Day because she is a great mom. This isn't always the case, but I thought it was funny. On the flip side of that, there are those that feel like the bond they created with their Ex's family is strong enough to transcend multiple breakups and even infidelity. There are those that have trouble letting go, and that maybe because they also had trouble letting go of the relationship itself. In my eyes, the family of your ex embraced you because of the love and joy you brought to their family member. Yes, they may have also liked you for who you are, but I believe it's your job to step away gracefully. If they make it a point to keep you around and invite you to things then by all means accept or reject the invitation, but keep in mind that holding on to their family is just another way of holding on to that old relationship. 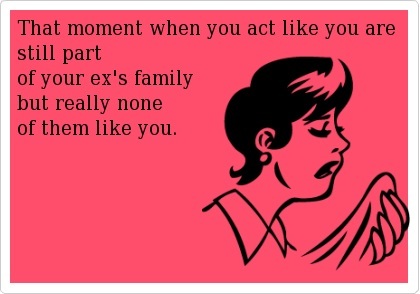 It's impossible to not see your ex in each and every one of their family members. Keeping up with your Ex's family is a tricky situation. In my opinion, it's best to ease your way out of that while making sure to be respectful to the family and honest with yourself. If you know in your heart that you still harbor feelings, treat it like a band aid and rip that sucker off. Going about it slowly will only make the process more difficult. You also risk the chance of running into your ex's new lover or hearing about the new one they brought to the last BBQ. Do yourself the favor and lean on your own family and friends. Autostraddle.com also published a piece on this subject, "How To Breakup With Your Ex's Family"